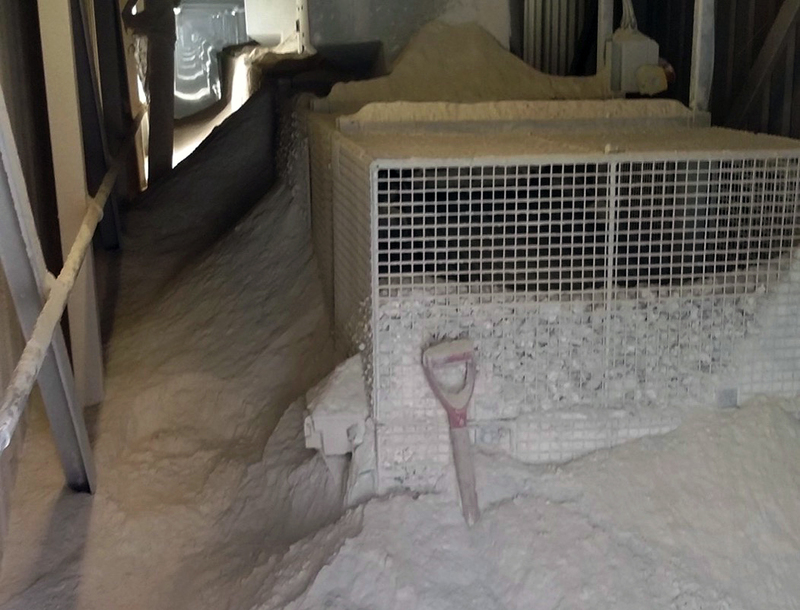 Once the upgrade was complete, the air inside of the conveyor enclosure was clear enough to see down its entire length, with dust management so complete that at first remote operators questioned whether the material flow had resumed or not. Singleton Birch supplies products and services for steel production, land stabilization, acid neutralizing, water treatment and building mortars. The limestone is extracted from the Melton Ross Quarry a short distance away and transported to the processing facility, where it is crushed to 150 mm minus (6 in. minus) and transferred to the kiln. Passed through the twin-shaft parallel-flow regenerative kiln running at about 1000ºC (1832ºF), the calcined soft-burned lime is discharged into another crusher and reduced to 50 mm minus (2 in. minus), and then either deposited into hoppers for bulk delivery or transferred to the GLC1 conveyor. 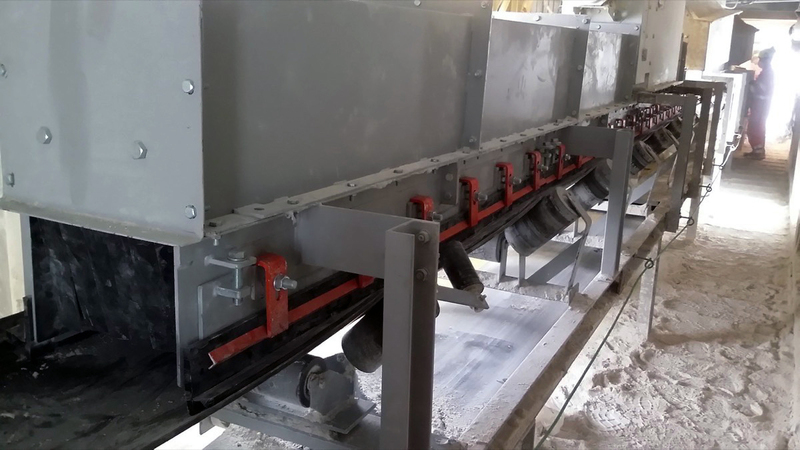 This system transports the limestone to conveyors leading to either the crushing and screening operation or the milling plant. The company currently produces 1.5 million mtpy (1.65 million tpy) of processed limestone and chalk, as well as approx. 300,000 mtpy (330,700 tpy) of calcium oxide products. Although the existing enclosure confined the fugitive dust, many serious issues arose due to the sheer volume and density of the particles. The abrasive particles would get into the bearings of rolling components and cause them to seize, leading to increased friction on the belt – a potential fire hazard. Dust would also build up around the loading zone and encapsulate the tail pulley, eventually causing the belt to just slide over the built-up material rather than riding on the rollers, which fouled the return side of the belt and the face of the tail pulley. Fugitive material would travel freely throughout the long tunnel, piling up and restricting access for maintenance workers to address these issues. Piled high enough to encapsulate the tail pulley, the dust blocked walkways, posing a potential hazard. According to Whelpton, to maintain normal operation of the system and avoid serious hazards, the area needed to be cleaned by two workers once per week, requiring nearly an entire shift. Before engaging in what he described as a “substantial undertaking,” the system had to be shut down so workers could see. Anyone entering the enclosed area was required to wear personal protective equipment (PPE), including breathing masks with respirators and hooded suits to protect against airborne particles. The plan included raising and lengthening the existing chute to create a more robust settling zone. Using 2.5 metric tonnes (2.75 tons) of steel, the contractor fabricated a 4-meter-long (13-foot) chute extension and tail box. 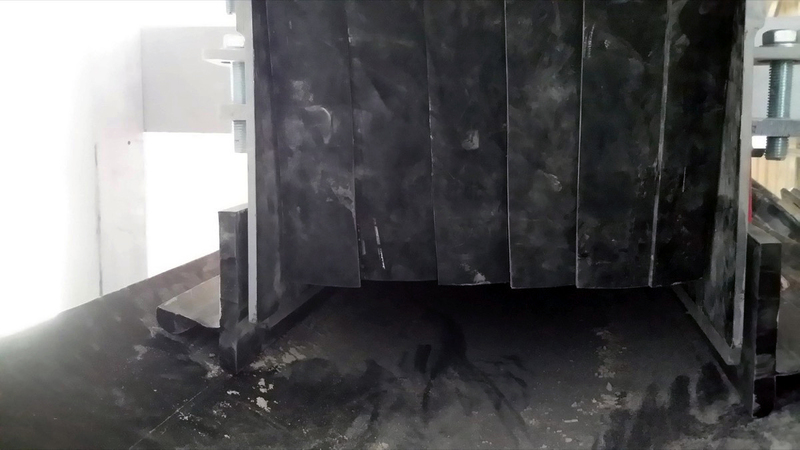 The overhaul integrated Martin® ApronSeal™ Double Skirting HD and an EVO® External Wear Liner to protect the chute wall and seal in the dust, with a series of dust curtains at the end. The external wear liner and apron seal help prevent damage to the chute wall. The new design raised the chute 102 mm (4 in.) from its previous position to accommodate the new wear liner. Mounting brackets with jackscrews provided a secure mount, with precision adjustment of the wear liner to reduce spillage. This system closes the gap between the liner and the sealer, thus eliminating abrasion from trapped material without interfering with existing supports. When accompanied by the skirting and clamps, the system forms a tight belt seal, delivering outstanding fugitive material control. Special mounting tabs allow the liner and skirt seal to be adjusted or replaced from outside the chute, requiring no confined space entry. Dust curtains slow down the air flow and reduce fugitive particle emissions. According to Whelpton, spillage and accumulation along walkways and around the mainframe have been eliminated. There has been no encapsulation of the belt or tail pulley since installation, and rolling components are far less prone to fouling due to dust and spillage. Protective suits are no longer required for people to enter the area, as they need only PPE masks to protect against trace particles emitted through normal operation. “This has led to a morale boost for the plant staff,” he pointed out. In addition to the complete turnaround of the operating environment and its effect on morale, managers were impressed by the reduced labor costs and improved safety due to external adjustment and replacement of the chute’s wear parts. Operators report the cleaning and maintenance schedule has been adjusted accordingly, freeing up staff for other assignments. The time and cost for replacement of rolling components and chute accessories is a fraction of what it used to be.